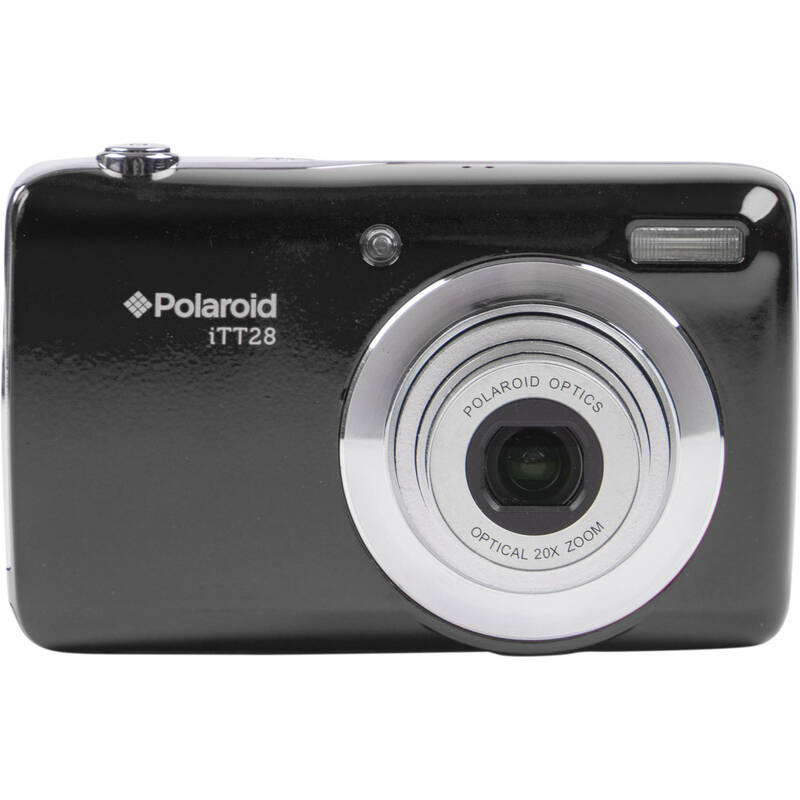 A slim, long-reaching point-and-shoot, the black iTT28 Digital Camera from Polaroid is a pocketable camera designed for everyday shooting. Revolving around a 20.3MP CMOS sensor, both high-resolution stills and Full HD 1080p video can be recorded, and a sensitivity range of ISO 100-400 benefits shooting in a variety of lighting conditions. Balancing the imaging capabilities is a wide-angle to super-telephoto 20x optical zoom lens, which is benefitted by Anti-Shake image stabilization to render sharper imagery when shooting handheld. Additionally, the camera sports a rear 2.8" LCD monitor for composing and reviewing imagery, and a built-in flash is also featured to provide additional illumination when shooting in low-light conditions. 20.3MP CMOS sensor is used for recording high-resolution stills and Full HD 1080p video, and also provides a sensitivity range of ISO 100-400. 20x optical zoom lens covers wide-angle to super-telephoto focal lengths to suit working with a wide array of subjects. Anti-Shake image stabilization minimizes the appearance of camera shake for sharper handheld shooting. Rear 2.8" LCD monitor is available for composing and reviewing images. Built-in flash can be used to provide additional illumination when working in low-lit conditions. Macro mode allows you to photograph close-up subjects. Auto Power Off setting automatically shuts down the camera to preserve battery life after 1, 3, or 5 minutes of inactivity. Box Dimensions (LxWxH) 8.1 x 6.7 x 1.6"
iTT28 Digital Camera (Black) is rated 1.0 out of 5 by 1. Rated 1 out of 5 by Roman from Hate it! The camera is made of cheap plastic. It doesnt go above ISO400, and in Auto ISO always gives me ISO50. The zoom has 4 stops, possibly digital zoom above 5x. At the longest zoom it just doesnt focus, photos blurry above 5x. Camera keeps going down to VGA even if set to 20mp. Oh, and the strap is impossible to get through the 2 holes. Dont be fooled by 20x zoom, go for same priced 5x instead. Zero stars.